Light pollution is a global change affecting a major proportion of global land surface. Although the impacts of Artificial Light At Night (ALAN) have been documented locally for many taxa, the extent of effect of ALAN at a landscape scale on biodiversity is unknown. We characterized the landscape-scale impacts of ALAN on 4 insectivorous bat species Pipistrellus pipistrellus, Pipistrellus kuhlii, Eptesicus serotinus, Nyctalus leisleri, and compared the extent of their effects to other major land-use pressures. We used a French national-scale monitoring program recording bat activity among 2-km car transect surveys, and extracted landscape characteristics around transects with satellite and land cover layers. For each species, we performed multi-model averaging at 4 landscape scales (from 200 to 1000 m buffers around transects) to compare the relative effects of the average radiance, the proportion of impervious surface and the proportion of intensive agriculture. For all species, ALAN had a stronger negative effect than impervious surface at the 4 landscape scales tested. This effect was weaker than the effect of intensive agriculture. The negative effect of ALAN was significant for P. pipistrellus, P. kuhlii and E. serotinus, but not for N. leisleri. The effect of impervious surface varied among species while intensive agriculture had a significant negative effect on the 4 species. 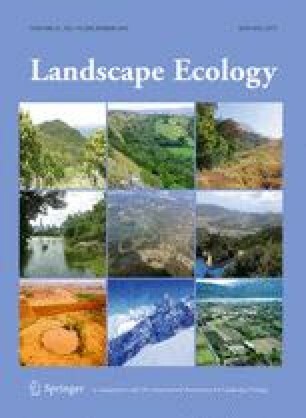 Our results highlight the need to consider the impacts of ALAN on biodiversity in land-use planning and suggest that using only impervious surface as a proxy for urbanization may lead to underestimated impacts on biodiversity. The online version of this article (doi: 10.1007/s10980-016-0417-3) contains supplementary material, which is available to authorized users. We sincerely acknowledge the engagement of all the volunteers in the French Bat Monitoring Program. We also thank the “Réseau francilien de recherche et de développement soutenable” and the R2DS PhD fellowship for funding and the 2 anonymous reviewers for their insightful comments on the manuscript. Hölker F, Moss T, Griefahn B, Kloas, W, Voigt CC, Henckel D, Hänel A, Kappeler PM, Völker S, Schwope A, Franke S, Uhrlandt D, Fischer J, Klenke R, Wolter C, Tockner K (2010) The dark side of light: a transdisciplinary research agenda for light pollution policy. http://www.goedoc.uni-goettingen.de/goescholar/handle/1/7268. Accessed 25 Nov 2014.